Following WWII, the U.S. experienced a dramatic rise in population growth. Beginning in 1946, more babies were born each year than in the prior year. This birth rate boom lasted for almost two decades before tapering off. 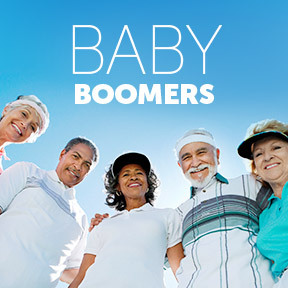 By 1964, 76.4 million baby boomers had been born, encompassing nearly 40% of the American population. As the baby boom generation reached adulthood, they helped bring lasting change in social and cultural values, and brought us Woodstock, ended a war, and ushered in an era of civil rights, consumerism, political activism, women’s liberation and sexual freedom. Today, the oldest of the boomers have reached or are approaching their seventies. As this generation draws closer to the typical retirement age, the nation’s median age continues to rise. Demographics show that about 10,000 people turn 65 every day. This trend will continue until the year 2030, when all remaining members of the baby boom generation will have turned 65 years of age, representing about 20 percent of the U.S. population. In the past century, Americans have enjoyed an overall gain of 25 years of life expectancy at birth. At the turn of the century, life expectancy at birth for males was only 46 years and for females 48 years. Today, that life expectancy has increased to 79 years for men and 85 for women. Gains in life expectancy will continue to grow along with advancing medical innovations, better nutrition and increased wellbeing, as younger generations age in healthier ways than their parents and grandparents. Today’s youth might do well to rethink “old age,” as the future of old age is the future for everyone. While the legacy of boomers will continue to be debated for years to come, studies show that boomers are not just fading away into retirement in the traditional sense. Boomers are not exactly sitting on the front porch rocking chairs watching the world go by. Instead, they are setting another trend we might term active healthy successful aging. Many are opting not to retire at all or are working long past the official retirement age. Entrepreneurship is strong among boomers when compared to other age groups. Statistics show recent retirees are twice as likely to start a new business as the millennial generation. Many are finding success by following their passions, using the skills acquired through a lifetime of employment, and turning doing what they love into opportunity for themselves and others. It appears that the baby boomer generation is changing societal views on growing older. People are not only interested in longevity but want to reach and enjoy their mature years in the best possible health. Aging well is broadly defined as physical, mental and social wellbeing during the senior years. Research acknowledges that a growing number of older adults have good health with low risk of disease and disability, high mental and physical functioning, and an actively engaged lifestyle. This, of course, doesn’t happen on its own, as it takes resilience, motivation, and acceptance to optimize one’s health and lifestyle. Boomers are more apt to push the limits of physical and mental functioning in order to reach an advanced age free of age-associated disease and significant physiological deterioration. It appears that a more comprehensive definition of successful aging would include these three elements: longevity, health, and happiness. Perhaps aging well has something to do with attitude, and making the best of what you’ve got no matter what stage of life you’re in. In a self-rated study, even those with chronic conditions felt they were aging successfully, believing they had quality and well as quantity of life. Boomers appear to be taking a holistic view of what contributes to aging successfully. Those with high levels of resilience, low rates of depression, few years of substance abuse, and a good social network are most likely to report high levels of life satisfaction well into their golden years. RevitalAge™ Ultra by Pure Encapsulations®: This scientifically researched hypoallergenic formulation offers specific ingredients, including botanicals, antioxidants, and sustained-release CoQ10, in support of enhanced cardiovascular, metabolic, and neurocognitive support. Gluten and soy free, Non-GMO formulation. Ultimate Antiox Full Spectrum by Designs for Health®: This powerhouse antioxidant formula delivers comprehensive full-spectrum antioxidant protection. Ingredients include vitamins, minerals and botanicals featuring Curcumin C3 Complex®, grape seed extract, garlic, and mixed tocopherols. Wheat, yeast, soy, gluten, egg, dairy, corn, sugar, preservative and artificial ingredient free, Non-GMO vegetarian formulation. AntiOxidant Formula by Pure Encapsulations®: This hypoallergenic formulation provides a broad range of antioxidants, as well as essential vitamins and minerals for eye, liver, and energy support. Gluten and soy free, Non-GMO formulation. Ultra Anti-Oxidant by Douglas Laboratories®: This product offers immune and free radical damage support with a wide range of antioxidants, vitamins, and minerals. Gluten, yeast, wheat, soy protein, dairy, corn, sodium, sugar, starch, preservative, and artificial ingredient free. Clinical Nutrients™ Antioxidant by Integrative Therapeutics®: This formula delivers a concentrated blend of 15 food-based antioxidant nutrients including vitamins, minerals and botanicals. Gluten, wheat, dairy, sugar, yeast, preservative, and artificial ingredient free formulation. While many women choose to age gracefully, we would also like to slow the hands of time. To reverse, delay or avoid frailty as well as conditions associated with aging, good nutrition and physical activity should be considered mandatory. Those wanting to remain mobile, independent, and enjoy a long, healthy, vibrant life should maintain a healthy weight, participate in enjoyable physical and social activities, and get the recommended intake of daily nutrients. However, as we age, we need fewer calories to maintain a healthy weight, making it more difficult to obtain the full array of micronutrients. Additionally, hormonal and metabolic changes, low dietary intake, and less efficient digestion and absorption can have a profound impact on nutritional requirements. Nutritional supplements may do more than fill in dietary gaps. They may also address particular health concerns of aging women, including enhanced support of bone, heart, and cognitive health. Studies have identified micronutrient deficiency levels in the range of 30 – 95 percent in those over 50, including certain vitamins and minerals critical to aging, such as B2, B12, C, D, E, folate, calcium and magnesium. Maintaining energy production, along with healthy muscles, joints, and bone, keeps the body strong and healthy, preventing weakness and frailty. Calcium and protein are essential to support the lifelong process of bone formation and maintenance. More than 99 percent of the body’s calcium is stored in the bones and teeth, leaving less than 1 percent in extracellular serum. While some individuals may meet calcium requirements through dietary sources and fortified foods, calcium absorption, unfortunately, declines with age. Per the National Institutes of Health (NIH), the average dietary calcium absorption rate is approximately 30 percent. Small amounts of calcium are utilized throughout the body for vascular contraction, vasodilation, muscle function, nerve transmission, intracellular signaling and hormonal secretion. Adolescents, post-menopausal women, the elderly, and those with allergies or lactose intolerance are at the highest risk for calcium deficiency. Adequate dietary protein provides the amino acids required for protein synthesis necessary for energy production, and the repair and maintenance of body tissues. Bones and muscles comprise approximately 50 percent of body protein stores. Seniors are more susceptible than younger adults for declining muscle mass during periods of inactivity, as well as for anabolic resistance, the impaired capacity to synthesize muscle mass. The loss of muscle strength and mass, known as sarcopenia, is found to some degree in more than half of adults aged 80 years and older. Sarcopenia may be the result of changes that occur with aging, including reduced physical activity, changing endocrine function, insulin resistance and increased dietary protein needs. Recent science suggests that the consumption of a good quality whey protein, ideally 20g daily, could help seniors meet adequate protein requirements. Along with sufficient exercise, protein supplementation could minimize the loss of skeletal muscle and reduce anabolic resistance. As renal function also decreases with age, a high protein intake is contraindicated in those with renal disease. However, there is compelling data to support the ability of high quality dietary protein to stimulate muscle protein synthesis in aging healthy individuals. Three synergistic micronutrients, vitamins D3 and K2 and magnesium work to strengthen bones and protect the heart. These nutrients are essential to the absorption and maintenance of proper calcium balance. Together, vitamins D3 and K2 shuttle calcium into bones and teeth, and help remove calcium from arteries and soft tissues. In order for muscles to exist in a neutral state, calcium and magnesium must be in balance. Magnesium helps in muscle relaxation, while calcium constricts the muscles. Proper balance is especially important to heart muscle health, helping to prevent angina, heart attack and hypertension. 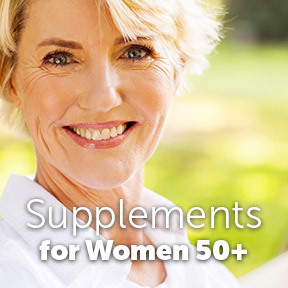 B vitamins, also critical to heart health, become more difficult for women to absorb as we age. Vitamins B6, B12 and folate help to properly regulate homocysteine levels, reducing the risk of heart disease. Vitamin B12 is essential for optimal brain function. The body’s ability to absorb B12 declines with age, which may increase the risk of dementia in older adults. The Institute of Medicine advises adults over age 50 to supplement with B12 to ensure sufficiency. 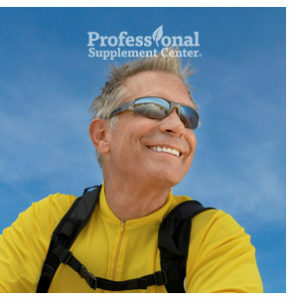 RevitalAge™ Ultra by Pure Encapsulations®: This scientifically researched blend offers sustained released CoQ10, acetyl-l-carnitine, alpha lipoic acid and pure resveratrol, as well as antioxidant and mitochondrial support cofactors in support of enhanced cardiovascualar, metabolic and neurocognitive support. Specific ingredients target cellular pathways and genes involved in the aging process. Gluten and soy free, Non-GMO, hypoallergenic formulation. Whey Protein Concentrate by Biotics® Research: Derived from the milk of grass fed New Zealand cows, this Non-GMO, low temperature, microfiltered whey protein powder provides 21g of protein per serving in support of healthy aging, detoxification, glucose metabolism, liver and gallbladder health, and weight management. Gluten free. Ultra Whey Plus™ Vanilla by Douglas Laboratories®: This product provides essential amino acids, 22g of protein per serving, an organic antioxidant fruit and vegetable blend and soluble fiber. Sweetened with organic coconut palm sugar and organic stevia in a natural vanilla flavor. Gluten, wheat, yeast and artificial ingredient free. Vitamin D Supreme With Vitamin K1 and K2 by Designs for Health™: This product supplies a clinically useful dose of vitamin D3 and highly bioavailable forms of vitamins K1 and K2 in support of optimal bone and arterial health and proper immune system balance. Gluten, wheat, dairy, sugar and preservative free, Non-GMO vegetarian formulation. Calcium Microcrystalline Hydroxyapatite by Douglas Laboratories®: This product supplies beneficial bioavailable calcium, phosphorus, amino acids, boron, and bone matrix proteins derived from young bovine bone in support of the maintenance of healthy bone structure and function. Gluten, wheat, yeast, soy, dairy, sugar and artificial ingredient free. How many of us, given a choice, would choose to grow older, especially when aging is associated with chronic illness and multiple prescription medications? As time marches on regardless, a better question might be—how many of us would choose to enjoy our golden years blessed with good health and vitality? Over the past century numerous infectious diseases have been conquered, only to be replaced by noncommunicable diet-related chronic diseases. As 76 million baby boomers approach or reach retirement age, medical care is focused on the prevalence of chronic health problems. A personal history of inadequate nutrition, poor daily choices and physical inactivity can culminate in preventable lifestyle-related diseases, including cardiovascular disease, hypertension, osteoporosis, type 2 diabetes, obesity, and certain cancers. Though we can’t turn back the clock, we can support our current and long-term health by understanding the influences of nutrition at the molecular level. Current recommended dietary guidelines for all age groups focus on nutrition for the maintenance of overall health and disease prevention. How important is a varied nutritious diet? The fact that many grocery stores have a section specifically dedicated to “health foods,” might give us a clue. Perhaps, if we begin to think of “natural food” as information that influences our genetic activity and cellular processes, we might choose to linger a bit longer in the healthy food aisles. Research has shown that diet is the key to controlling genetic susceptibility to disease, and our genes can only respond to what we give them. Scientific research shows that although we may inherit genes from our parents and ancestors that increase our susceptibility to certain diseases, disease is not necessarily our destiny. We can replace foods that trigger our genes to induce inflammation with foods that quell inflammation, and thereby circumvent chronic disease. We can eat low-glycemic foods that minimize insulin secretion, as opposed to high-glycemic foods that stimulate insulin release and result in high blood sugar and diabetes. We can eat a high fiber diet that supports colon health, instead of a low-fiber diet that may encourage colorectal cancer progression. We can take charge of our health by changing the expression of the epigenome at any stage of life simply by making wholesome nutritional choices and incorporating a healthy lifestyle. Perhaps it’s time to challenge the belief that disability, dysfunction, dementia and disease are normal and inevitable as we grow older. Many chronic illnesses are disorders of metabolic processes that result from our toxic environment and our nutrient depleted lifestyles. Nutritional science has shown us the complex relationship between health, the genome and life-long dietary interactions. We now know that many diseases that were once thought to be gene-related, result from nutritional deficiencies. Vitamins, minerals, phytonutrients, and antioxidants are considered key players in genetic expression modulation. Researchers have identified active plant derived nutrients that can help to prevent cancer and protect against diseases. We now know that the root of many diet-related chronic conditions take hold early in life. Dietary changes, such as reducing sugar, salt and unhealthy fat consumption, could have a substantial effect on reducing the burden of disease. Even more so, a meta-analysis recently published in the International Journal of Epidemiology looked at 95 studies on fruit and vegetable intake. They concluded that eating 10 daily servings of fruits and vegetables, or about 2 cups of fruit and 3 cups of vegetables, would result in a 24% reduction in heart disease risk, a 33% lowered stroke risk, a 28% lowered cardiovascular disease risk, a 13% lowered cancer risk and a 31% lowered risk of premature death. Changes that occur naturally with aging do affect nutritional needs. Along with reduced energy requirements, lean body mass and basal metabolic rate steadily decline. While the caloric need for protein, carbohydrates and fats may be reduced, the requirements for vitamins, minerals and other essential nutrients may rise. Filling our bellies with health sustaining fruits and vegetables has been shown to reduce cholesterol and blood pressure, and support vascular and immune health. It sure seems like a no-brainer! Aging may be inevitable, but poor health is not. If you want to maintain vitality and enjoy a longer, healthier life span, start by eating a variety of fruits and vegetables and be sure you are getting sufficient amounts of vitamins, minerals, antioxidants and phytonutrients. Ultra Anti-Oxidant by Douglas Laboratories: This potent formula provides a wide spectrum of nutritional antioxidants, as well as synergistic nutrients that effectively participate in antioxidant defense systems. Gluten, wheat, soy, dairy and yeast free formulation. RevitalAge™ Ultra by Pure Encapsulations: This scientifically researched, sustained-release formula provides antioxidant protection and mitochondrial support cofactors in support of healthy aging through the maintenance of youthful gene expression, mitochondrial function, and cellular energy production. Gluten and soy free, Non-GMO formulation. Phytoganix™ by Metagenics: This highly nutritious organic red berry formula provides a convenient and delicious way to support overall good health with a diverse daily supply of phytonutrients. Gluten free, vegetarian formulation. Super Greens Berry by Neurobiologix: This great tasting, high ORAC value, energizing powdered phytonutrient formula provides certified organic whole food plant extracts, plus natural vitamins, ionic trace minerals, digestive enzymes, antioxidants and symbiotic microorganisms. These ingredients support maximal energy production, healthy digestive function, and immune optimization, as well as repair, revitalization, recovery, and longevity. Gluten, wheat, soy, and dairy free formulation. Power Greens Premium Berry by NuMedica: This state-of-the-art, great tasting greens and superfoods drink mix, provides high quality energizing phytonutrients, certified organic whole foods, digestive enzymes, adaptogenic herbs, plant extracts and pre- and probiotics, along with a full complement of vitamins and minerals, in support of optimal health and longevity. Gluten, wheat, soy and milk free, vegetarian formulation.